When considering rabbit training, you need to understand what a rabbit's behaviour pattern means. There are various reasons for training a rabbit. When an owner considers training, it is usually because the rabbit is a house pet. The first thing to appreciate is that rabbits are intelligent creatures and may easily understand what you are trying to get them to do. It could be that any rabbit training attempts by you lead to frustration, since all you get is that appealing stare and then they just carry on with what they were doing. 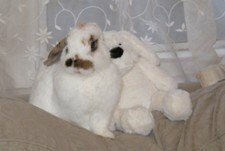 If your rabbit is a house pet and has free range of a room/s or large area, then it is obvious you going to want to make sure the rabbit is litter/toilet trained. It could be that you are intending to introduce a new rabbit to an existing one or even a new rabbit to two or more other rabbits. Perhaps you want your rabbit to come to you when you call? It is possible to train your rabbit to come to you when you call or for the rabbit go to its cage/hutch when requested, or maybe even perform a little trick or two. With litter training it will make a difference if the rabbit is spayed or neutered. The age of the rabbit can have some bearing or even the type of litter box. Maybe your rabbit does go to toilet in the same area, but not the area that you want. The problem is rabbits are not like other pets and there is huge lack of knowledge on the proper care and training for a rabbit. Obedience training, such as when you train a dog, does not work. A dog, by nature, is a pack animal and in a pack would be submissive to the head dog of that pack. In the same sense a dog likes to please their Human master. But rabbits are social creatures. In their natural habitat they live in warrens under the ground, where there is a social hierarchy based on which rabbit is the strongest but where the rabbits cooperate in such a way that benefits the whole warren. As you can understand, they have no inbred desire to please the Alpha male or, in this case, the human Master. Rabbits do not like being picked up and they do not like being held. They love being groomed, they love being stroked and having attention paid to them, but to a rabbit these are totally different from being restricted or lifted up high and held. A rabbit is a prey animal and many other animals consider a rabbit to be fair game to chase and attack. For this reason, a rabbit's instinct is to escape and being high above ground or held is not going to calm your rabbit. Obviously, it is important to be able to pick your rabbit up and carry them, when required, but there are correct and incorrect ways to do this. Rabbits do not respond to physical abuse or any form of abuse borne from frustration. With rabbit training, if your thinking of going along the punishment route such as shouting, yelling or any other unsavoury practices, it just does not work. In fact, it has the exact opposite effect, in that the rabbit considers the human an enemy and will become aggressive or afraid and withdrawn. To train a rabbit correctly you need exactly the opposite to threats or shouting, which are incentives and/or rewards. In addition, by understanding behaviour patterns you will be in a better position to train your rabbit for the intended purpose. By being aware of what certain behaviour action means, is actually a form of communication with your rabbit. On this page we give links to those various training tips and techniques, plus help on recognising what a rabbit is conveying when it performs certain behaviour activities. It is helpful to understand, when rabbit training, that what you may consider naughty is natural behaviour to rabbits. Chewing, digging, scratching up carpet, marking a corner with urine, they are all natural activities. With love and patience you can train your rabbit. With repeated, positive responses by the owner, the rabbit will learn to understand what is meant. Failure to train is usually down to the wrong approach or not enough time spent on training.